This page contains all changes and bug fixes for Load Impact. Receive monthly email notifications whenever our changelog is updated by going here. Released 2019-03-28. See changelog for full details of new additions and bug fixes. Released 2019-03-26. See changelog for full details of new additions and bug fixes. Support for variables (at all scopes + dynamic). Support for authentication methods (except Hawk). Support for global variables exposed by Postman: globals environment data iteration. Support for file formats v2 and v2.1. Insights: New "Thresholds" tab with threshold charts. Insights: New "Checks" tab with list and group views to list all checks with bar charts. 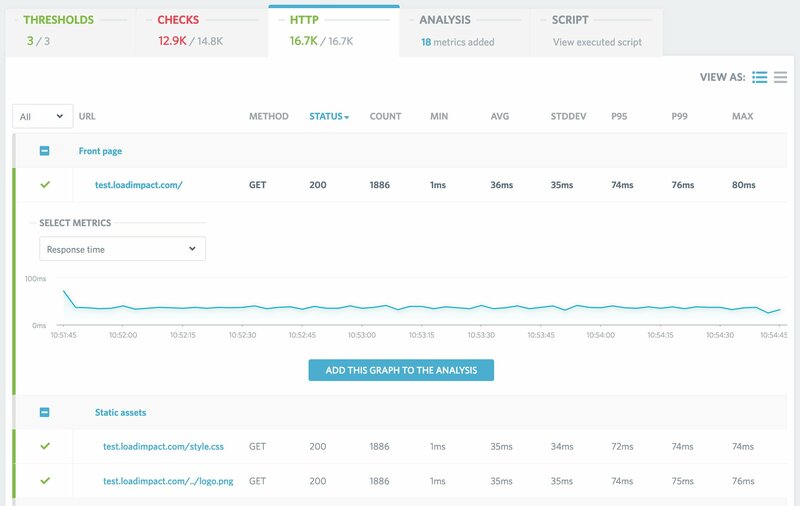 Insights: New "HTTP" tab with list and group views to list all HTTP transactions and charts for response times and request rate. Insights: New "WebSocket" tab with protocol specific metrics. Insights: New "Analysis" tab for metric comparison and correlation, also the new home of custom metrics. Insights: Broke up the "Breakdown tree" into individual tabs: Thresholds, Checks, HTTP, WebSocket and Analysis. Released 2019-03-20. See release notes for full details of new additions and bug fixes. CLI: You can now specify a CLI flag --console-output (or K6_CONSOLE_OUTPUTenvironment variable) to redirect output from the console.log() family of APIs to a file. Thanks to @cheesedosa for this feature! New results output: StatsD and Datadog. You can now output any metrics k6 collects to StatsD or Datadog by running k6 run --out statsd script.js or k6 run --out datadog script.js respectively. Thanks to @ivoreis for their work on this! k6/crypto: random bytes method. This feature adds a method to return an array with a number of cryptographically random bytes. Thanks to @bookmoons for their work on this! k6/crypto: add a binary output encoding to the crypto functions. Besides hex and base64, you can now also use binary as the encoding parameter for the k6 crypto hashing and HMAC functions. Error codes: we’ve unified the handling of error codes. k6 will now emit an error_code tag in the metrics output (and expose a property with the same name on http.Response) when there’s an error in making a request. Create test view "Upgrade now" buttons not responding. Insights: Test run result data export to CSV. UX: New left menubar items CLI, Docs and Help. UX: Do not log out user on password change. 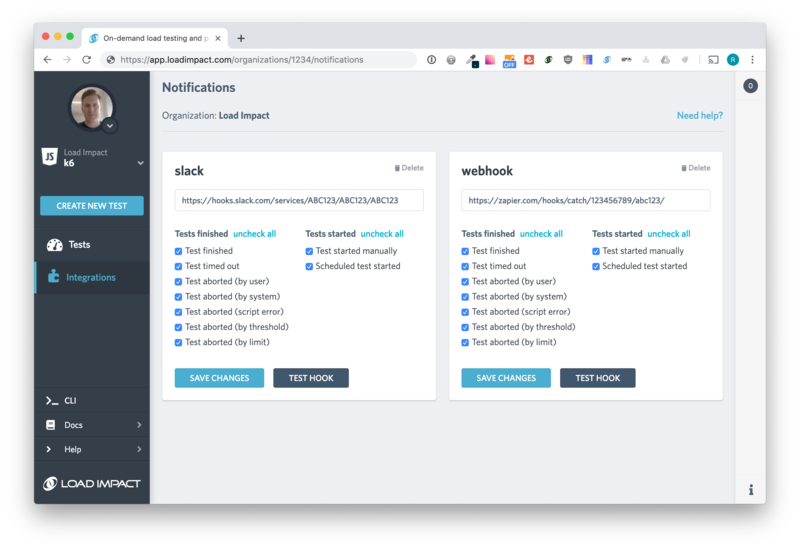 Notifications: New options to configure with more granularity when notifications should be triggered. You can now select to only be notified on test failures for example. Insights: support to visualize tests with longer duration. K6 cloud tests can be aborted by thresholds. Cloud thresholds can be aborted by the UI or CLI. Insights: groups are ordered after execution order in the breakdown. K6 projects can run k6 tests by providing URLs or a HAR file. Use k6 version 0.20.0 for cloud tests. Insights: can visualize k6 main script for cloud tests. Insights: can share a k6 result. Insights: allow to upload larger tests. Support thresholds in k6 cloud execution. Added a new k6 test run status: “Processing data”. Fix: k6 performance trending chart displays up to 100 test runs. Insights: support uploading larger tests. k6 tests are sorted by creation time instead of starting time. Insiders can create k6 projects. CLI: When running test, pressing Ctrl+C will now abort the test run. CLI: When running test API errors will be ignored by default, option --no-ignore-errors has been added to loadimpact test run command to implement old behavior. Fix: can upload data store from user scenario page. Fix: when a k6 project is selected, the integrations page shows the option to access your user token. Insights: Improve design details when the test data is empty or loading. Insights: New tab panel for the Breakdown and URL table sections.